San Francesco Foods has been open for over 60 years and has earned its status as an Italian food institution in Toronto. The family-owned Italian takeaway is that you “gotta go to” place if you love Italian food – and really, who doesn’t? From their humble beginnings on 10 Clinton Street in the heart of Little Italy, San Francesco Foods has expanded to seven locations across Ontario and continues to gain a fanatic following. And it’s no wonder: they serve delicious Italian food prepared with great care and masterful skill. 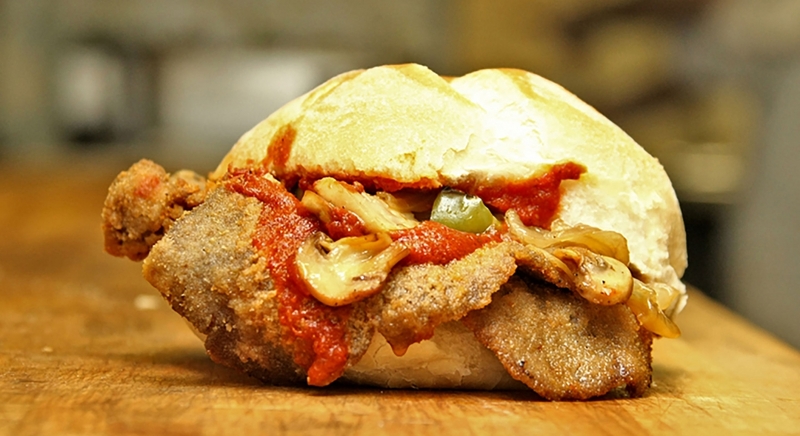 For over six decades San Francesco Foods has been serving the best veal sandwiches in Toronto and beyond. These high-quality authentic Italian sandwiches have become a culinary phenomenon. People travel from all over to experience that familiar childhood memory: the Original San Francesco veal Sandwich. It’s tender, made with an excellent sauce, fresh buns, and a generous serving of cheese. You can choose your level of heat from sweet to spicy! Their infamous “San Fran Sauce” is absolutely amazing and stands out on its own. It’s made with a top-secret blend of spices and herbs that’s cooked for over 24 hours. They dip their veal sandwiches in it and it tastes out of this world. Sandwiches are what San Francesco Foods is known for, but they take in pride in presenting an array of foods made with fresh ingredients. The chain has generated a lot of buzz because of their award-winning pizzas, panzerotti, gelato, lasagnas, and poutine. From their first location on 10 clinton, they’ve expanded to 7 locations and continue grow. Each location has their own unique assortment of San Francesco Foods staples, but you can expect the same family feel across them all. SmoothPay is available at their 736 Bay Street and 609 Queen Street West locations. Get rewarded $5 when you spend $75 with our mobile payment and loyalty rewards app. Credits are automatically applied to your next purchase after you hit a milestone. Our app also lets you discover a ton of great places nearby!